New Rimmel London moisture renew lipsticks! I hope you are all doing well. I haven't been able to post much lately as I have been very busy. However I am here today to talk about the new Rimmel London moisture renew lipstick. The new lipsticks come in two finishes bold and sheer. I personally prefer the bold finish and I love adding some translucent powder over the top to make it matte. 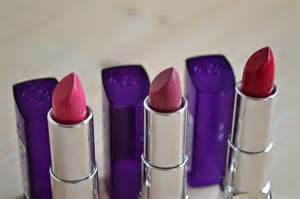 The lipsticks are very moisturising and feel really silky on the lips. It also doesn't feel like you are wearing lipstick which is great for summer when you don't want to wear much makeup. I did find myself having to re-apply the lipstick after drinking. The lipsticks don't last very long on your lips so best to keep it in your handbag for throughout the day.